The good thing about marrying young (I am not encouraging children to marry young ha! I am just saying that there is an advantage if you look at it from a different perspective) is you are forced to become extra responsible. And you learn to be resilient because everyone’s out to prove that you are bound to fail–no kidding. I once worked for 12 hours a day during odd hours to pay off our credit card bill, save for Kelly’s delivery AND save for my last sem in Ateneo (I graduated late since I spent three months in London for my internship; hence, I missed one sem). I was also studying while working. Not everyone knows that, at the same time and for the same reasons I was working those long hours, Arjay would bike from our home in Cainta to his station in Makati (and back) just so we can cut back on our transport costs. In 2013, with ourselves and two kids to feed, we took advantage of what Arjay’s assignment in Pilillia had to offer and started to live on just P60 a day. I bet you didn’t know that, did you? 😀 We ate food we caught ourselves, food we grew in our garden, or food that our neighbors gave us as a ‘thank you’ for Arjay’s service every time the fire crew helped an injured person or put out a fire. Sometimes, our neighbors would give us food just because. Amazing town. I can’t say that we deprived ourselves during our stay there because we truly enjoyed it! Breastfeeding our youngest helped a lot as well because we did not have to spend on formula. He was also on cloth diapers then so no expenses on disposable diapers. We brought this lifestyle with us when we moved nearer the city. By 2015, we invested on a prime property in Antipolo and bought a new car from the money we got when we sold our old car. P190,000 in exchange for a P1.2M property and a new car, not bad eh? We also let go of our apartment and bought a rent-to-own condo. We realized, why rent when you can eventually own the place you are renting, right? Of course, P190,000 is not enough to pay for the full price of a prime lot, a condo unit and a brand new car. We still needed to pay off the balance. If there is one goal we want to achieve this year, that is to become totally debt-free. I would not categorize the debts we incurred in 2015 as “unwise debt” because what we need to pay off are three essential things for us, not fancy gadgets or unreasonably expensive clothes bought for the sake of being “in”. Why did we buy these three things? 1- The lot in Antipolo will serve as our permanent home as soon as we pay it off and have our house finally built. 2- Instead of renting, the rent-to-own condo provided us a home and a soon-to-be rental property in a very convenient location. 3- Instead of constantly having our old car fixed, we bought a new car with less maintenance costs. Because: Maintenance Costs of Old Car > Monthly Payment of the New Car. Our remaining debt amounts roughly to P2.6M. Holy cow, that’s huge! How do we plan to pay that off in a year’s time? I have been reading a lot about Dave Ramsey’s Debt Snowball Plan wherein the first order of business is to pay off the smallest debt first as opposed to starting with the highest one. Do I think it works? Yes. Looking at our finances now, I see that this is working pretty well for us. It is very achievable. By ticking off small payments from your list first, debt payment will seem less daunting. 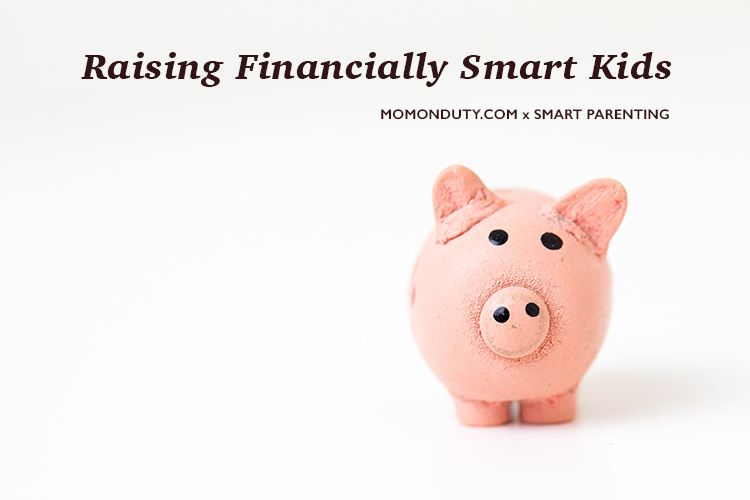 It makes debt payment quicker (due to the momentum it builds as you scratch off one debt after another). The first step we did back in December was to cut back on our expenses and saved what we can save. Cable TV for P1,000 a month? Weekly movie dates that amount to P1,000 each time you go see a movie? Who needs those when you have Netflix for just P350 a month? Daily coffee dates? Nah! Just brew a cup at home and enjoy an early morning caffeine treat from your balcony. We have saved quite a lot just by making these simple lifestyle changes. And when we received our bonuses last December, we did not spend them on lavish gifts. We just bought the minis a simple gift each and took them on a budget trip to Baguio. The rest of the money was kept in the bank to prepare for 2016. It took a lot to successfully implement delayed gratification, especially during the holidays, but it paid off. I really wanted to buy the new iPhone, but soon realized it is an unnecessary expense. Arjay wanted to purchase accessories for our car, but we thought those accessories are not urgent concerns. We are thankful we were able to control ourselves despite having money to spend that month! Come January 2016, while people were scrambling to get back on their feet (financially), we had a month’s worth of money to pay for our January bills even before they arrived. Arjay calls it sandbagging. 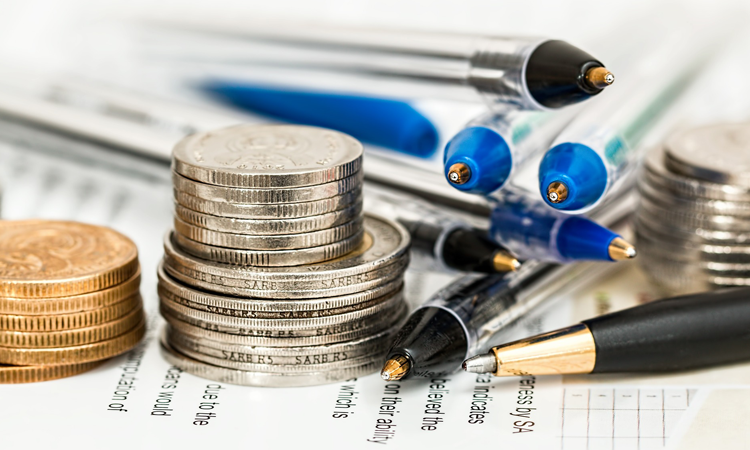 The advantages of being a month ahead of your expenses are that it lessens the struggle to look for money to spend come bill time (no more paycheck-to-paycheck living) and you get to have a very good overview of your income and expenses (hence it becomes easier to put money away in your savings). Instead of waiting every 15th and 30th of the month, imagine having money prepared at the start of the month to pay off your bills. To make this even more of a success, pair this with the envelope (or plastic accordion, whichever makes you happy) method so you know exactly where the money should go for the whole month. Since we already have our January bills taken care of, all we need to think about are our February bills plus our seed money for the Debt Snowball Method. Combined with the money left from December (this is the amount after putting away money for January) and my and Arjay’s January incomes, we again implemented the envelope method for February and used the extra amount to add to the payment of our smallest debt. Can you see where this is going? If we keep up with this payment scheme, who knows? We might just pay off that P2.6M debt within a year! If we don’t, at least we are on our way to becoming debt-free. Remove unnecessary purchases from your expenses. If you have extra money, go a month ahead of your expenses and implement the envelope system. If you don’t have extra money, it is still worth it to implement the envelope system. Make your minimum monthly payments to all your debts. Do not skip a single one to avoid costly penalties. Are you paying off debt too? If you have tried the Debt Snowball Method, share your story in the comments section below! Hi Kim, mother and a homemaker. Resigned from job when my son started his primary years. 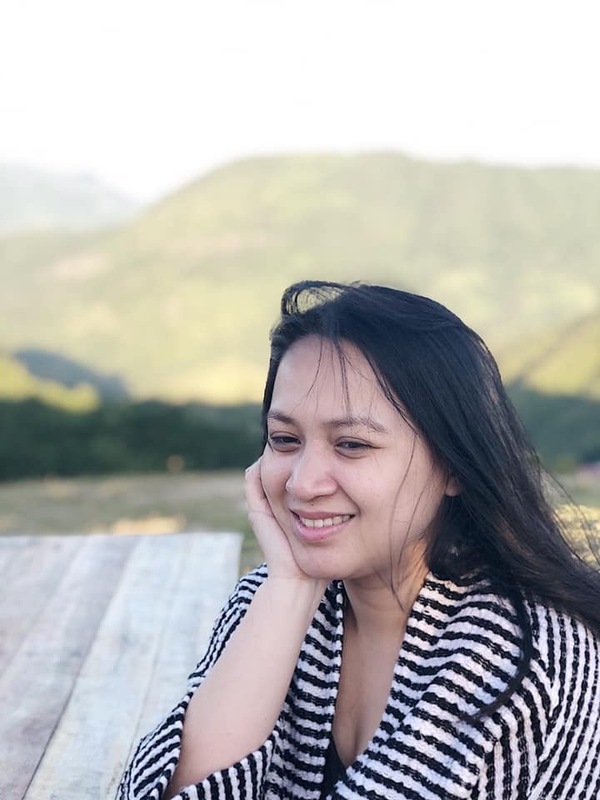 An accountant and no regret why I stopped working. To this day, son is in his junior high and honestly expenses get high esp tuition. I also applied a month ahead of paying debts and it really works. Husband is working also but right now i feel bored since my son is a young adult now. Depedency I must say… Any tips? Hi Olivia. Maybe start working from home as a bookkeeper/accountant? There are lots of people doing this. Ok lang yan kahit hindi biglaan. Slow and steady lang. The important thing is to start paying off debt. The sooner you start, the sooner you’ll get it done. Good luck! 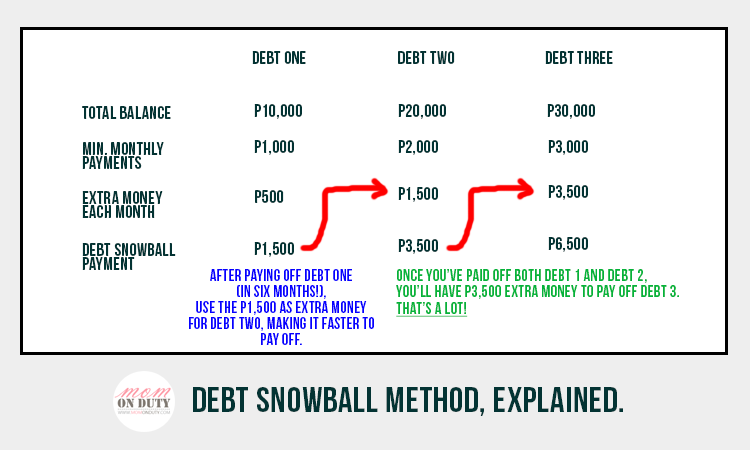 The snowball method in paying debts must be one of the best pieces of financial advice out there! I myself just got out of, well, a good debt (just paid my lot in full this month woot!). My problem now is minimising shopping expenses, especially online shopping! That I’m working on. I agree with you that there’s a good thing about marrying young. This is a good scheme since we are also paying for our debts too. Thanks for posting this. Good for you! I’ve met a lot of moms who do the envelope system. It really works wonders when it comes to budgeting. You really see the cash flow kasi so you know if you’re about to run out. I have to study that snow ball method. I hope it works for us too! This all the more inspires me to literally cut my credit card. I have some unnecessary payments because of unscheduled purchases. Thanks for this. Congratulations on having an efficient debt-free plan. Maraming mothers ang mabaliw-baliw na siguro sa kakaisip kung pano magbabayad ng utang. You should post more about this. I have a lot of tricks under my sleeve. We’ve gone through difficult times, and learned a lot of ways to get through those times. I should share noh? Thanks Lani! Thank you! Our goal is to clear all our financial obligations before we turn 30. We’re working really hard on it! Hi Kim! I also do the debt snowball method and I swear by it. 🙂 I cleared credit card debt in 2014 because of it. Kaya lang i didn’t keep the discipline to stay off the credit card so I have some again. I will clear it out in a few months using the same method. Pero amazing yung living on 60 pesos a day ha. Hi Vera! We’ve been without a credit card since 2012! For online payments, we use a prepaid card. This way, we really have to save up for something we want, in cash, so we don’t have to deal with another CC debt again. I should write about how we lived on P60 a day, noh? A lot of my readers are very curious how we did it–but it is possible! We’re living on more than that now, but thinking of going back to that lifestyle again. I thought it’s time that I shared these stories. We aren’t here if we didn’t work (and sacrifice) for what we have. Cheers to wise spending and the best future we can give to our children!